RagSan family reached Sanskar’s palace. All were admiring at the palace. They entered into the palace. Cool breeze blowed. SwaLak and RagSan are sitting in upstairs open balcony and chit chatting. Laksh: Amazing. It gives Antique look. Swara: even me too told the same, when i look it first. Sanskar: yeah, it was so old. It was constructed nearly 100 years ago. Ragini: but you told it was constructed nearly 2000 years before. Laksh and Swara looks confused. Laksh: no Rags, look at these pillars, stairs. It looks like new only. Means just 80 years or less than that. Sanskar: yeah, but these are all alterations in each generation so far. Also, Ragini what i told you also true only. Swara: you are confusing, Sanskar. Mansi joins them: i will explain. Sanskar: haan, didi came. She knows everything about this clearly. She will explain. Mansi: this front past is built only before 90 – 100 years. Not exactly known. Back part is real palace. Which is built nearly 1800 – 2000 years before. Swara, i told you na restricted part.i.e, that back part only. Ragini: why it is restricted? Mansi: don’t know. For so many years it is not used. Then, Sanskar’s ancestrar who lived 100 years before built this front part and used it. After to his time, it is used for rituals either it is good or bad. Mansi: ok, let’s go and sleep. Tomorrow we have to wake early because we have to go little deep into forest for go to temple. Mansi: Sanskar you share this room with Laksh, we three will share guest room. Sanskar makes faces, When Swara and Laksh smirks at him. Next day, everyone get ready in early morning and starts walking into forest. Swara: it seems like trekking. They reached the temple. It is a full forest area. Guru jee and chottu is waiting for them already. Sanskar and Ragini takes blessings from Guru jee. Chottu: Sanskar bhai, how are you? Long time no see. Sanskar smiles: fine, chottu. What about you? You are improved Chottu. Guru jee cleared his throat. He smiles awkwardly. Guru jee: let’s start puja. First everyone go to that pond and pour holy water on your head and come. They did as Guru jee told. Guru jee: now, Ragini should light diya for Goddess. Ragini wonders how he knows her name. She lighted diya. Guru jee: now you to put Garland on each other. Then, Sanskar you fill her hair line with this sindhoor. Both put garland on each other’s neck. They share an eyelock. Then Sanskar filled her hairline with sindhoor. Guru jee: now you both show aarti for goddess. They did as Guru jee told. Everyone closed their eyes and prayed. Guru jee: Now, you two should walk around this temple for 108 times. Others wait for them. They starts walking around temple. That is small temple only. So, it is easy to walk. They walk little slowly. Others sit in steps of pond. Scene shifts so far from that temple. Sangini is standing infront of half finished temple, which is glittering in sun light which fall on it from whole on the concrete ceiling. That temple is hidden from outsiders with wall and ceiling. Sangini: i am waiting for this day for nearly, 1400 years. I shouldn’t miss this chance. I should make atleast anyone of my family to remember their previous birth. She hear a oracle: Whatever Sangini, you have only 20 days. My promise to you is going to be fulfilled. If you want to complete your Vow, you should do it before 20 days. Sangini fold her hands: Shiv ji, I don’t know what to react. Whether to be happy for my rebirth that to my mom and dad or sad that i have only 20 days to make my mom and dad realise there is a unfinished work which they only can do it. I should do something. Here, Ragini and Sanskar complete their ritual and they sat near pond for relaxation. Sanskar: i am sorry Ragini, i never think this ritual will be this much hard. 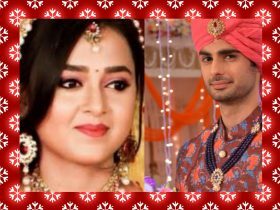 Ragini smiles: it is not that much hard Sanskar. Ragini: if we did it with pure and willing heart, it won’t pain. Whether it is paining for you? Sanskar in the manner of coping: no no. Not at all. But it is painin to you na. Ragini hits his shoulder playfully: how you are changing voice modulation instantly. Sanskar hold her hand: i am not changing my voice, i am serious. Janaki: let’s go Ragini. Sanskar beta come. Sanskar annoyed: not even let to spend little time alone. Ragini: Shhh. They may hear. Let’s go. Sanskar gets up and lift her in his arms. Ragini: Sanskar, what are you doing? Sanskar: your legs will be paining. I won’t let you down. Ragini: it’s not at all paining, let me walk. What if they saw us? Sanskar shook his head: then promise me, you will meet me at terrace today night. Ragini: you are blackmailing me. Sanskar: say yes or no. Otherwise i will take you in my hands till we reach home. Ragini: yes, i will come. Ragini: paka promise. Now let me walk. He smirks at her. They reached home. It’s already afternoon. Everyone is hungry. Ragini and Mansi serve them all. Later they too had. Everyone went to have little sleep because of their disturbed sleep last night. They wake after night fall only. Mansi already prepared dinner for them with noodles they brought. Mansi: adjust for today. I wake late. So, it is easy to cook. Laksh: didi, if you gave a water with your hand means itself, it will taste like nectar. Then this noodles will be our feast today. Sujatha: then, if i gave water means, how it will be my son? Laksh coped: it will alsi be taste like nectar, mom. After dinner, they didn’t get sleep. Swara: let’s play hide and seek. Sanskar: yeah, we will play Laksh. It’s boring na. Sanskar gestured her to be silent. Swara pleads everyone and make them agree. Swara: then who will be first out? Laksh: it won’t work at us. You only wish to play this. If you didn’t agree then we won’t come for play. Sanskar: only inside home. You shouldn’t hide in terrace also. Sanskar: then Swara, you went outside hone and count upto 50 loudly. Before that we will hide. Swara went out and she starts counting. Everyone went into each room and tries to hide some where. Sanskar hold Ragini’s hand and take her to terrace. Ragini: Sanskar, you only told, we shouldn’t hide in terrace. Terrace has little little walls which will hide if anyone stand there to other houses. Sanskar pinned Ragini to one wall and looks at her mischieviously. Ragini: so this is your plan. Sanskar: whether you don’t like it. Ragini: what you will do if i say i don’t like it. Sanskar moves towards her lips: i won’t care. He pressed his body against her intensely. She closed her eyes. He hold her waist tightly and press it. She moans his name. He caressed her lips with his softly and pulled her into him. His kiss become passionate. His hands trailed to her back and caressed her back sensually. He trailed his lips all over her neck and little lower. She pushed him away and turns. He pulled her from back and removes her hair to side and kissed on her back. She felt ticklish and closed her eyes. He untie’s her blouse knot and plant wet kisses. His hands went into her saree and touched her bare belly and hold her tightly. He lowered her blouse little and kissed her shoulder, pulled her more into him. She breaths heavily. He caresses her crook with his lips and face. She turns and lock his lip with hers. Both kissed passionately. The post SANGINI: A Warrior Princess (RagSan) Chapter – 10 appeared first on Telly Updates.